Contemplate standing amidst the vast rolling sand dunes of the world’s oldest desert, and also one of the driest. Initial perceptions would have to be of a bleak, barren and lifeless landscape. Yet, amazingly, life abounds out here because ingenious indigenous species have had to adapt physically and behaviorally to the challenges that the arid and thermally-extreme dynamics have posed. A major predicament for plants out here is their obvious lack of ability to follow the sporadic rain and as a result have had to endure the full force of the unrelenting sun. It is probably this single factor that has led to the evolution of some of the most remarkable adaptations in order, not only to survive, but to thrive under these bleak conditions. Mammals that reside in the Namib have the ability to perform local migrations to take full advantage of the very sporadic rainfall. This ability to perform local migrations is still insufficient in an area where favorable conditions might only endure for a very brief period and so the mammals, much like the plants, have evolved their own unique array of adaptations. During the era of the dinosaur when the continental plates of Gondwanaland began to drift apart, forming the African and South American continents as we know them today, the Namib Desert first came into being. The oldest rocks formations found on the Skeleton Coast were originally deposited between 1000 and 700 million years ago and so entitles the Namib to hold the honor of being the oldest desert on earth. This is not its solitary classification, but another claim to fame is that it is also one of the driest places on the planet, where the coastal region has a mean annual rainfall of between 2-20mm per annum. With the cold Benguela current pushing up along the coastline the area is assured of receiving very little or in some areas, no rain for decades. The only dependable moisture is derived from this coastal fog and is produced when the moist air masses from the Atlantic are cooled over the cold Benguela current and then blown inland over the dry and hot interior. The extraordinary flora of the region has to count as amongst the most bizarre in the world and one of the desert’s most exceptional inhabitants is the locally endemic plant, the Welwitchia (Welwitchia miribalis). Carbon dating of some of the larger plants reveal that there are those that are over 2000 years old and with individual plant numbers as low as a few thousand it is also one of the rarest plants on the planet. All plants on earth fall into either one of two categories, either flowering or non-flowering plants. Surprisingly the reproductive structures of the male welwitchia plant resemble those in flowering plants, while the reproductive structures of the female plant resemble the cones of conifers; non-flowering plants. This remarkable plant throws all known survival strategies out of the window by not only flourishing in the dry habitat, but it does so by not abiding by the scientific rules of desert survival. While most desert plants try and reduce the size of their leaves to reduce transpiration, with some even losing their leaves totally, welwitchias have two extremely long broad leaves that continually grow throughout its lifetime. It was believed for many years that the welwitchia plant was totally dependant on the fog for its survival. However, they do not transpire during the night as many of the true desert-adapted plants do, but their transpiration rates at midday are exceptionally high for a desert plant. It is now known that the plants help balance the extremely high rates of water loss by exploiting drainage lines with their long lateral roots. The multitude of succulents found in the area have a bizarre array of adaptations that follow the more traditional and scientifically accepted norms of desert survival. In desert adapted plants the surface area to volume ratio is paramount to survival. The idea is to minimize the amount of surface area subjected to the unrelenting sun while maximizing the internal volume for water storage. The optimum shape therefore would be a sphere which is almost exactly what the Adenia pechuëlii, otherwise known as the elephant’s foot achieves in its fat swollen stem. The Hoodia plant, made famous by its amazing hunger suppressing qualities, has been used by desert dwelling people for centuries and is now being touted as the new wonder diet. The hoodia has to some extent the same fat swollen stems, but it also employs the benefits of having knobbly surfaces which minimize the amount of heat that they will absorb by scattering the direct radiation from the sun. The extraordinary Lithops species also known as ‘stone plants’ or ‘flowering stones’ because of their cryptic resemblance to the stones and rocks that surround them, minimize their moisture lose from their surfaces by concealing most of their surface area underground. This buried existence also helps to reduce the amount of direct radiation that the plant is exposed to. Their subterranean existence may benefit them when it comes to losing moisture and limiting radiation, but proves to be a hurdle when the plant needs to photosynthesis. These ingenious little plants have overcome this dilemma by having small semi-transparent openings on the extremities of their leaves, much like windows, that allow the sunlight to access the chloroplasts that lie deep within the leaves. An archetypical mammal of the dry deserts, the oryx has its own amazing adaptation which allows it to flourish in some of the driest regions of the world. Without this system an animal would have to sweat copious amounts of precious moisture to keep its body temperature and blood temperature below levels that would be fatal. The remarkable oryx employs a system referred to as the carotid rete system. This system only cools the blood that is supplied to the heat sensitive brain. If the blood was to reach the brain at the same temp as it was in the body it would be instantly fatal for the unfortunate ungulate. The carotid rete system allows the animal to drop its blood temperature by those few critical degrees and it does this by splitting the carotid artery into a network of smaller arteries which lie alongside the vein carrying blood back to the heart from the animal’s sinuses. This blood has been cooled by evaporative cooling when the animal is panting and there is a transfer of heat between the blood flowing through the carotid rete system and the cooler blood. 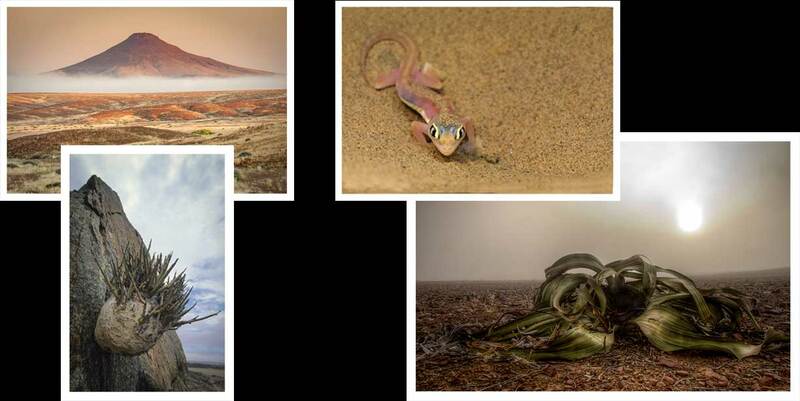 Many lizard species have also flourished out in the vast sandy expanse of the Namib, and there are a large number of species that have evolved amazing adaptations in order to survive in this harshest of environs. Living on steep, soft sandy dune faces poses its own host of problems. Exposed to the heat and to predators because of the lack of cover, the reptiles have two options of escape, either traverse the dune slope at high speed or dive below the surface where it is cooler and safer. The sand-swimming lizards such as the shovel-snouted and the wedge-snouted have highly specialized feet with extremely long toes on their hind feet, and either elongated or extremely fines scales covering their bodies which help minimize resistance when swimming through the sand. As their common names aptly imply these lizards also have wedge-shaped heads that help minimize resistance when they dive below the surface and swim through the sand. Unlike the nostrils of other lizards which are forward pointing, the nostrils of these dune lizards point upwards so that sand grains don’t penetrate into the nostrils when moving forward through the fine particles of sand. The shovel-snouted lizard also has a special bladder alongside its lower intestines where it can store moisture that it licks from its body and any other exposed surfaces during the hours of moisture-laden fog. The web-footed gecko as its name implies doesn’t have the long toe adaptation, but rather has web feet which has more to do with its ability to dig at a rapid speed, rather than using them for any high speed locomotion. Another reptile which is a locally endemic to the area, is Peringuey’s adder (Bitis peringue). The snake is also known as the sidewinding adder due to its unique motion which propels it forward while keeping as much of its body from contacting the burning sands when hunting through the dune fields. The adder’s eyes and scales have evolved to make the most of its ambush technique and both resemble the grains of sand in which it lies remarkably well camouflaged. The eyes also sit on top of its head while the rest of the body and head is covered by grains of sand. The Dune plated lizard, a species with an herbivorous diet, which is rare in the world of reptiles, allows the species to take full advantage of the deserts most abundant food supply, detritus, which is the wind blown collection of grass seeds, husks and the odd body part of insects which collects at the base of many dunes. Much like the Dune plated lizard, the Shovel-snouted lizard also makes use of this fairly reliable year-round food source. Another species that makes use of the reliable detritus is the tenebrinoid beetle species which also have an array of adaptations in order to survive in the harsh desert ecosystem. They have perfected the fog basking behavior which enables them to utilize the moisture that condenses on their wing covers during the early morning fog. It does this by climbing to top of a dune, raising its rear end and the moisture condenses on it’s tough wind coverings. The sloped angle allows the drop of moisture to run down to the mouth where the beetle can quench its thirst. The Onymacris plana beetle is also one of the fastest insects on the planet. Like a half-crazed wind-up toy ,they dash round at high speed, which helps them minimize the amount of heat absorbed while traversing the hot dune surfaces. These ancient beetles also have the unbelievable ability to digest tough cellulose. This development has obviously been a direct evolutionary response to the availability of the wind blown detritus. Sandgrouse are a fairly common bird species encountered in the harsh desert environs. They seem to appear from nowhere in their thousands, especially in the early morning and late afternoon when they congregate at available water sources. They, too, have an impressive thermoregulatory system which they put into operation when temperatures approach the 31 degrees Celsius mark. It begins initially with a drooping of the wings which exposes the sparsely feathered underside and allows the bird to lose some heat. If the temperature continues to climb they fluff up their feather and cluster together, much like what one would expect from birds who are trying to keep warm. This “fluffing” prevents further heat intake by insulating the bird from the relentless sun. If the temperature rises even further they perform a gular fluttering which is much like panting in mammals. These birds nest on the barren, isolated plains well away from water which poses a hurdle when it comes to providing the chicks with something to drink. These Sandgrouse employ an amazing adaptation by which they fly to a water source, wade in and soak their specially adapted belly feathers with water and then fly back to the nest with this unique water container. This challenging Namib environment not only provides a home for the unique smaller species but also provides sanctuary for some larger animals that are not normally associated with this type of habitat. Although not occurring in large numbers, lion, elephant and black rhino have also learnt to tackle and adapt to the challengers that this unforgiving ecosystem presents. The basic rule of survival in this type of an environment, for all species small and large, is that the water intake must exceed the rate at which water is lost. Even when this balance is achieved, survival is still balanced on a knife edge.